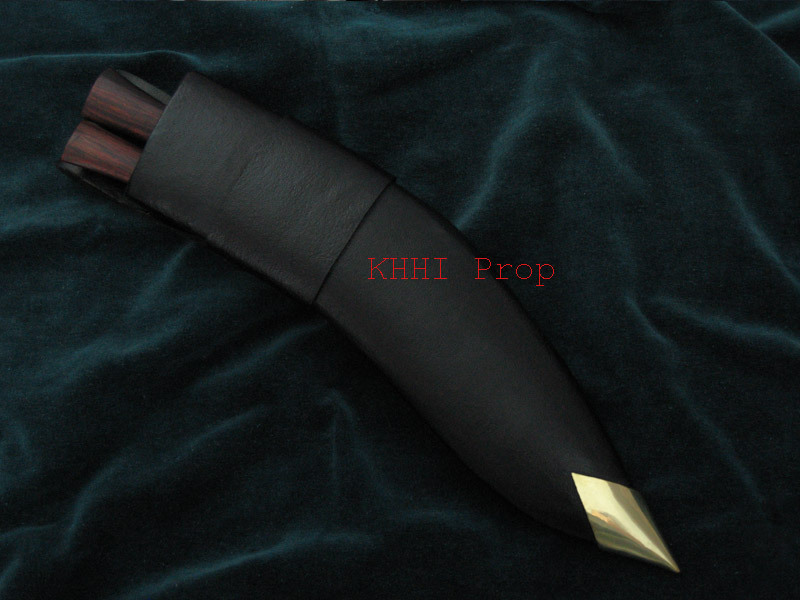 An extra scabbard comes with Karda and Chakmak; very handy to continue and sustain the assignment.. Domestic water buffalo hide is used to cover the inner wooden frames of the scabbard. The natural hide is painted black to give the original and typical look. A brass chape is also fixed at the front section for protection and presentation. 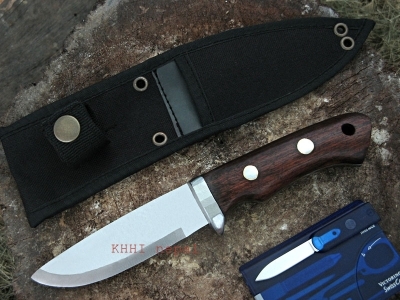 The scabbard also comes with the two regular accompanying knives; “Karda (small utility knife)” and “Chakmak (sharpener)”. 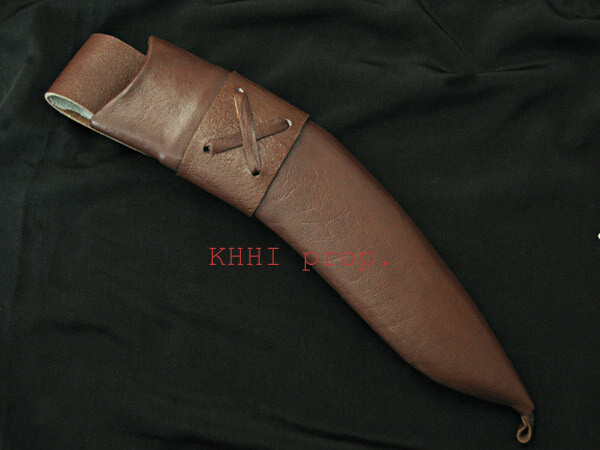 Since a leather scabbard is somewhat sensitive to the outside temperature and weather plus it may wear off soon with excessive use it is highly recommended to have an extra or a back up scabbard for your khukuri. Sometimes there is also a possibility that the sharp edge of the kukri blade may cut through the leather making it unsafe to use anymore. Ignoring such fault may lead to some serious damage to finger as the two inner wooden frames used to making the scabbard leave a small elongated gap that only gets wrapped/covered by the buffalo leather. In a case like this an extra scabbard would come very useful to continue and complete an assignment. Thank you for the opportunity to give feedback on your products. 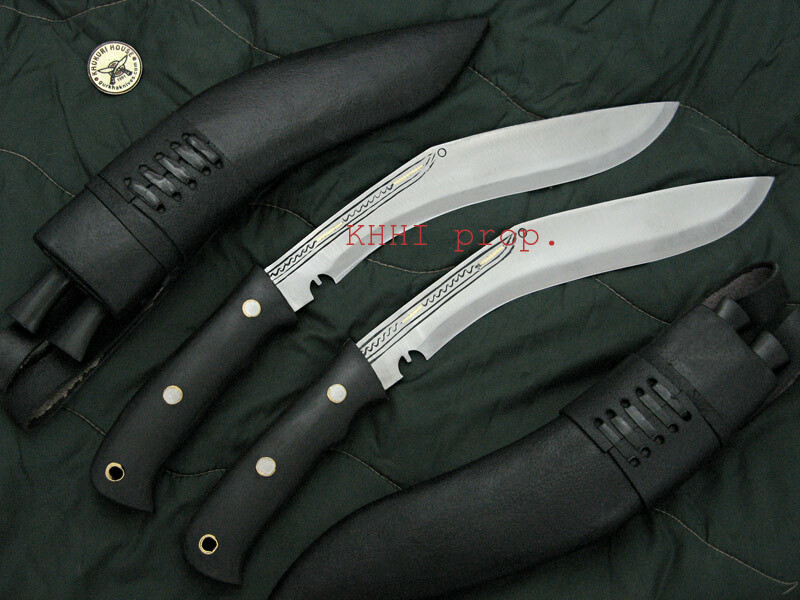 I am a loyal customer and I have been using KHHI khukri for some time. I think the quality is outstanding and have even shown them to a couple of Nepali guys that approve of them. I use them in the field and have been pleased with their performance. I received my scabbard in a very short time considering how far it had to travel. The quality is as to be expected from KHHI, top notch. That being said, I have a couple of issues. The first issue that became apparent was fit. My khukri does not fit well; it takes a lot of force to get the khukri to go into the scabbard. Another fit issue is that once it does go inside, it appears to be about 5mm too short. With all of my other khukri, the blade is completely inserted into the scabbard, to the hilt. I did specifically state that the scabbard was to fit the 2012 Issue khukri. The second issue is that the description of the scabbard included the “ 2 x Accompanying Knives” which were not sent.